I guess you could tell from my post the other day that I was pretty intimidated by my new sewing machine. That fear was really getting the best of me, and the silly thing is that I have no idea exactly what I was afraid of. Anyway, Sunday morning I decided that enough was enough; I was going to conquer that beast. If I'm ever going to make a quilt, I need to feel comfortable with my sewing machine. So maybe it would be better if I started with a smaller project? 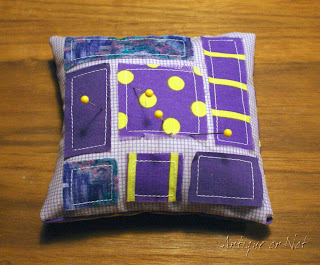 As I was cruising through my favorite blogs, I came across a scrappy pincushion that Heather at Crafting... had just completed. Isn't it adorable? Heather said that she had been inspired by a pincushion done by Lucy at Charm About You, which was also way too cute. 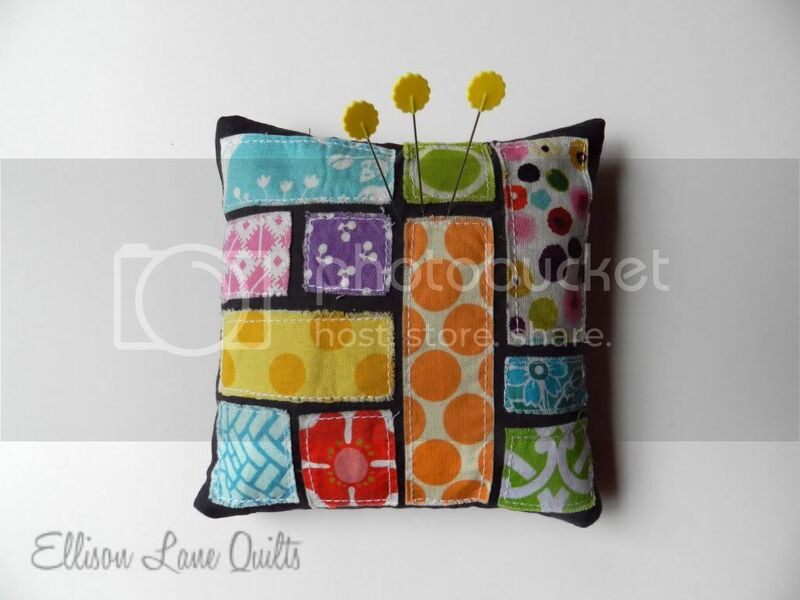 Lucy, in turn, was inspired by the tutorial done by Jennifer at Ellison Lane Quilts for making a scrappy pincushion using a Lapel Stick. I don't have a Lapel Stick, had never even heard of it, but soon figured out that the Lapel Stick works a lot like a glue stick for fabric. Pretty cool! Whew! I'm dizzy now from all the blog-hopping! Isn't it amazing how we bloggers get inspired by each other? 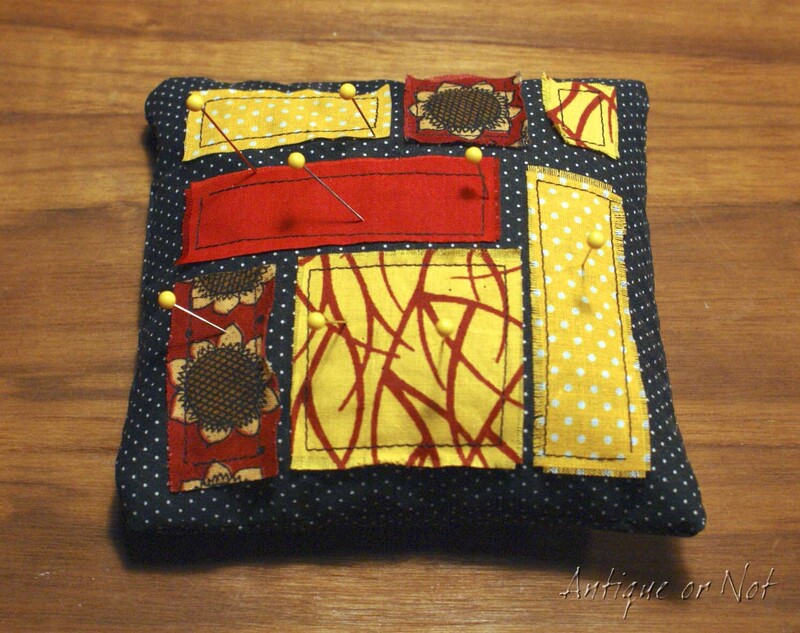 It was obvious: I needed to try to make a pincushion. How hard could it be? It's only 6 inches square...not a lot of sewing needed. Even without a Lapel Stick, surely I could do this. Right? Of course I could! Two hours later I had finished not one, but two, scrappy pincushions. Like Heather, I filled mine with uncooked rice, which worked out just fine. After making all my mistakes on the first pincushion, I immediately made a second one that was much easier. This one has better stitching, which is good because it's going to be a gift. The fabric on the back side is the dark purple with the yellow stripes, rather than the lavender gingham that's on the front. Today is our Christmas gift exchange at the sewing circle I've been going to, and this will be part of the gift I'm giving, along with a stack of pretty fat quarters. Next time I make a scrappy pincushion, I'll use a bigger variety of fabrics for the patches and will cut them smaller, but these seemed to be okay for the first time out. Plus I'll try not to color coordinate them like I did this time; it's really hard to try to be random when you're so used to matching and coordinating colors. Once I was done, I was so proud of myself! I know these are small, simple projects, but for me this was a big accomplishment. Now I feel a lot more confident about trying something a little larger. You go girl! I think they're cutesie. You did a wonderful job Pam! So glad you conquered your machine. I'm glad you shared this because I'm the same way with some machines. I take them out of the box and they sit and I look at them, a bit intimidated... I have no idea why... Once I get going on them usually (key word, usually) things go well! The first pin cushion looks good to me!!!! Glad you conquered your fear of The Machine!!! I too, would be color co-ordinating!!!!! Now, on to bigger projects!!! Love your pin cushion! You did a great job! !